Each month, we feature a survey on the Homepage of our website and invite members of our online community to take part. Results from November’s website survey. 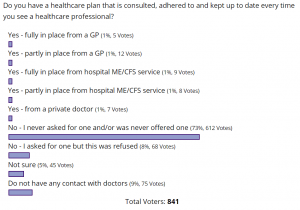 For November, we asked about the provision of health care plans. This month we continue to gather patient feedback that will be useful in the preparation for the new NICE clinical guideline on ME/CFS. We are asking about the provision and quality of medical evidence from NHS GPs and specialists. Provision of social or respite care etc. These are all key components of the overall management of people with ME/CFS and success is far more likely if a health professional who is actively involved with your care is being supportive and providing medical evidence upon request. Anecdotal feedback to the ME Association indicates that while some NHS doctors and specialists are very willing to provide supportive written reports without charge, others charge a fee, provide unhelpful reports or may even refuse.